[+] Artistic origami design: sampling of representational origami art; tree method and its use. 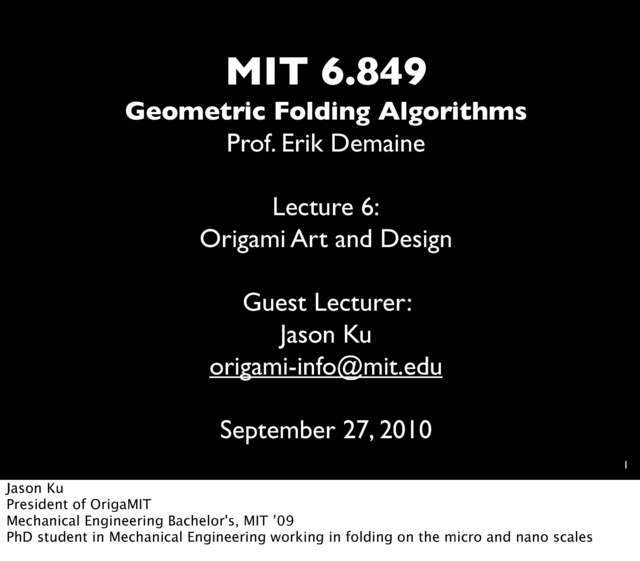 This is a guest lecture by Jason Ku, president of OrigaMIT (the MIT origami club), PhD student in mechanical engineering, and prominent origami designer. His lecture will be about his perspectives on artistic origami design. Lecture 4 outlined the tree method algorithm of origami design. Now we'll see how this method applies in real-world examples. The first half of the lecture will introduce the artistic side of representational origami. In origami, as in many disciplines, familiarity with the canon of work that already exists can be quite useful in understanding avenues for future creative development. Thus we'll cover the works and styles of a sampling of the world's most renowned paper folders. 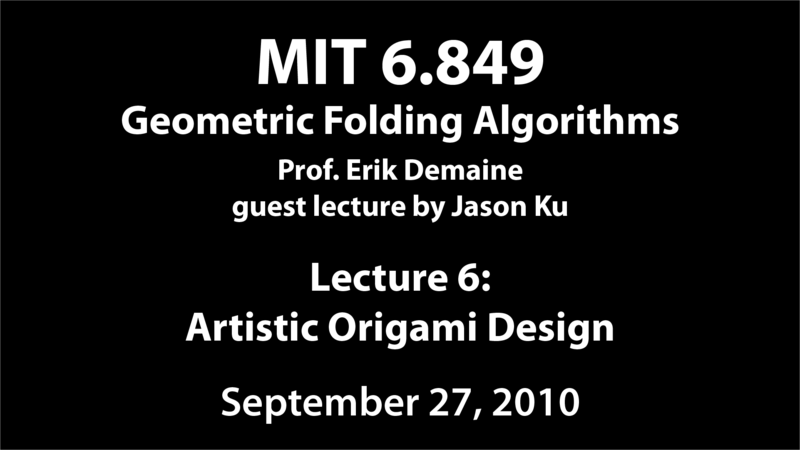 The second half of the lecture will focus on the actual design of representational origami art. We will briefly review tree theory, weigh the pros and cons of this design method, and emphasize the relationships between a tree, a circle/river packing, and the locus of possible hinge crease in a uniaxial base. Finally, we'll go through the process of designing an origami model with, then without, the help of TreeMaker.